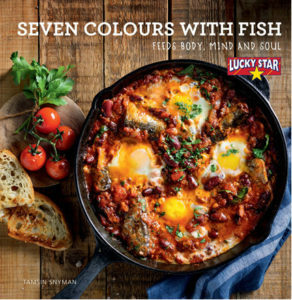 Lucky Star recently launched their fourth cookbook in a series of cookbooks published by Tamsin Snyman Publishers, Seven Colours with Fish. 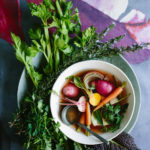 This book captures a sense of colourful occasion without being too fine or too fussy, and presents a variety of quick and easy dishes that are nutritious for the whole family. Lucky Star is such an iconic South African brand and their range of canned fish is good enough to eat straight from the tins – from pilchards to middlecut, tuna, mussels and sardines. Canned fish is readily available in most supermarkets throughout the year, making it an accessible source of affordable protein on a daily basis. All Lucky Star pilchards are caught and immediately frozen at sea before being brought back to the factories to be cooked with the seal on – no preservatives or artificial colourants needed. You shouldn’t remove the soft bones either, as they’re a great source of calcium. Seven Colours with Fish is available countrywide for only R85.50 countrywide at selected bookstores or directly from www.tamsinsnyman.com. 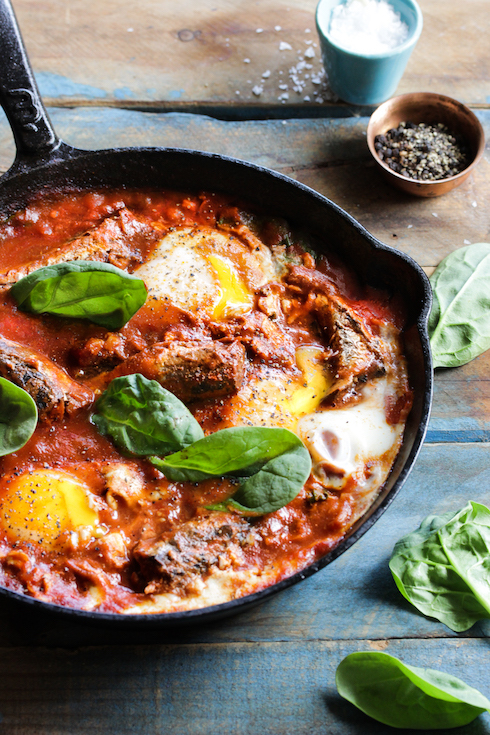 Here is my take on Tamsin’s fabulous cover recipe for pilchard shakshuka, omitting the beans and adding a few more spices. This is such a stunning, flavoursome, bright and bold breakfast (or anytime meal), especially after a late night! And so easy to make. 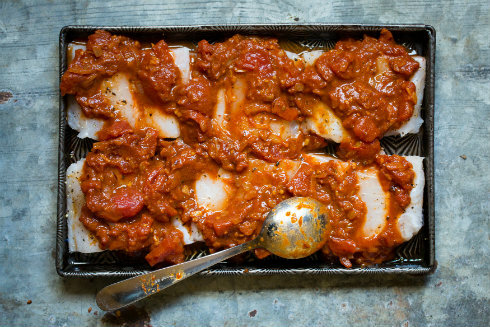 Separate the pilchard fillets from their tomato sauce and set both aside. Heat the oil in a standard skillet (23 cm) and fry the onions until golden brown. Add the garlic and fry for another minute, stirring. Add the spices and stir for a few seconds, then add the canned tomatoes and sugar as well as the reserved tomato sauce, and season generously with salt & pepper. Stir and bring to a simmer. Add the spinach and stir, then cover with a lid and let it simmer until spinach is wilted (about 2 minutes). Crack the eggs into the simmering tomato mix (make little wells for them), then cover with a lid and simmer over low heat for about 5-6 minutes until the whites are cooked and the yolks are still runny (or however you prefer your eggs). Serve hot with some fresh spinach leaves (if you want to) and toasted bread for dipping. Note: If you are making hot shakshuka, serving it with some fresh coriander leaves work very well. We’re all looking to gain smart new habits for coping with the little water left in the Western Cape. Hoping to avoid “day zero”, let’s adjust to a new normal of being truly water conscious and saving every drop that we can. When we were struggling with power outages a few seasons ago, Private Property wrote an article, Energy savings will be crucial this winter. With the current water shortage they asked me to put together a few dos and don’ts of foods/recipes to embrace and to avoid. 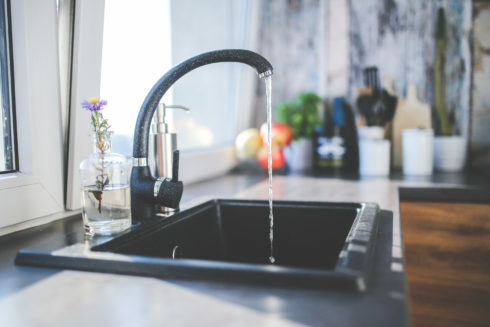 Check out Private Property’s houses for sale, and remember these handy tips: Keep a water-less hand cleanser in the kitchen and bathroom to minimize rinsing your hands under running water. Keep the plug in the basin plugged in (or use a larger bowl/bucket) to reuse grey water as far as you can. Spinach, mushrooms & cheddar frittata with sage butter. Photography by Tasha Seccombe. 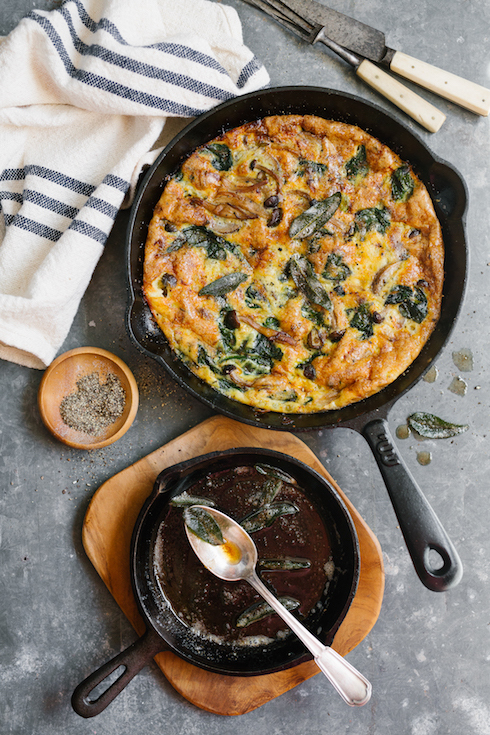 Mushroom, spinach & cheddar frittata: this is a one-pot recipe that is perfect for breakfast, brunch, lunch or dinner, and also as leftovers for the office the next day. It can be eaten hot or cold, so no reheating required, and no extra dirty dishes gained. 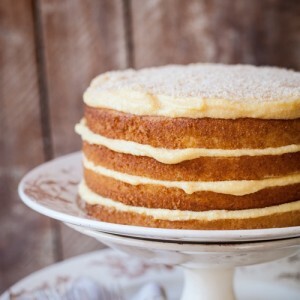 And yes, you can ditch the sage butter! 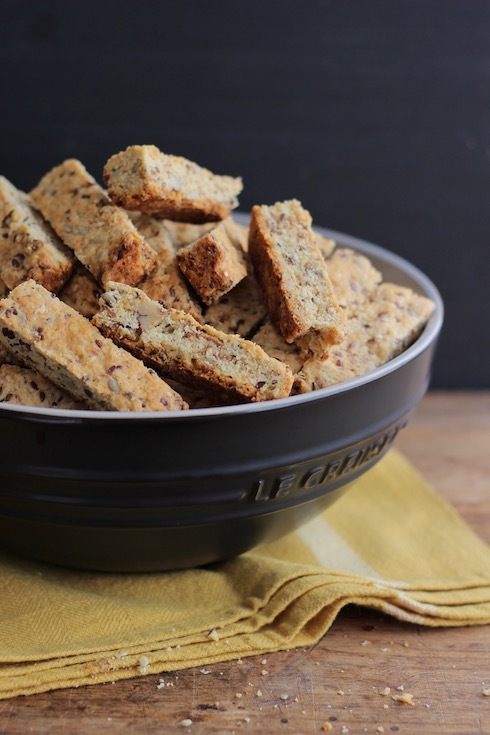 Delicious buttermilk rusks with various seeds, nuts, oats, coconut and pecan nuts. All-in-one breakfast rusks: limit your tea/coffee intake by filling up with these “waterless” rusks – dip 2 or 3 in your one cup of daily coffee, and you might not require another cup soon. 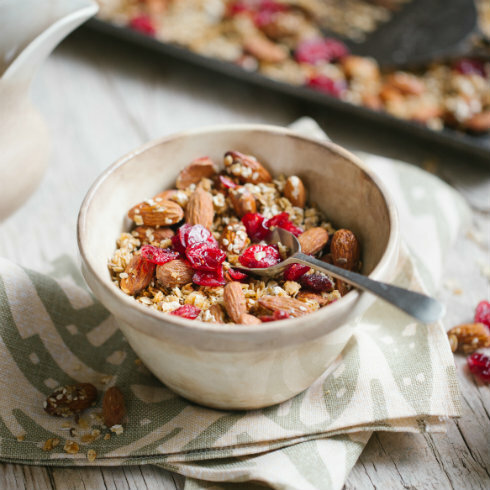 Freshly toasted granola with cranberries. Photography by Tasha Seccombe. Granola with almonds & cranberries: made with no water, this granola recipe is so delicious topped with a dollop of yoghurt. To minimize dirty dishes, add a few tablespoons directly to your plastic yoghurt tub (and not other way around). 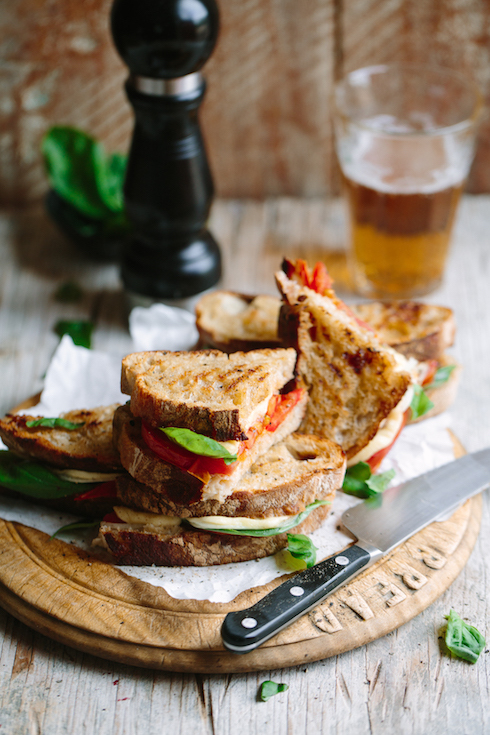 Freshly braaied ciabatta sandwiches with fior di latte, tomato, basil and chutney. Photography by Tasha Seccombe. Afritalian braaibroodjies: these can be assembled anywhere without using any water. Eaten with your hands straight from a plankie, they’re the perfect waterless food items. My ultimate caprese salad with soft mozzarella, an array of tomatoes, fresh basil, pesto and toasted pine nuts. Photography by Tasha Seccombe. 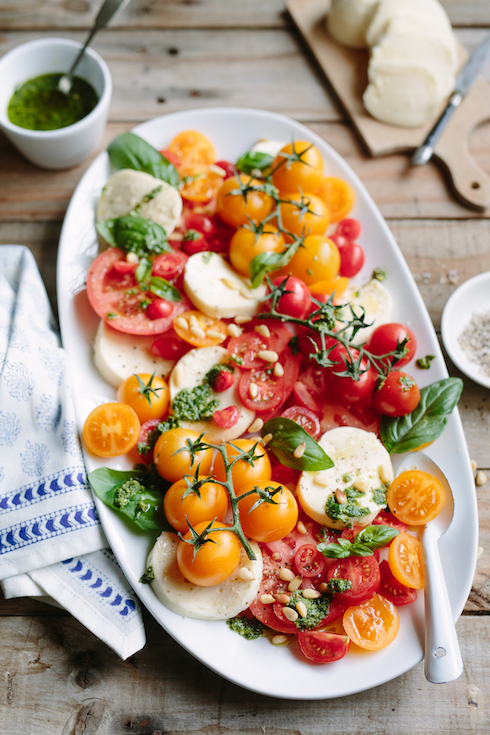 Ultimate caprese salad: no rinsing necessary (unless you want to wipe the tomatoes with a damp cloth), easy to assemble, and the juices can be mopped up with crusty bread straight from the plate. Baked tomatoes with feta, garlic, thyme. Photography by Tasha Seccombe. 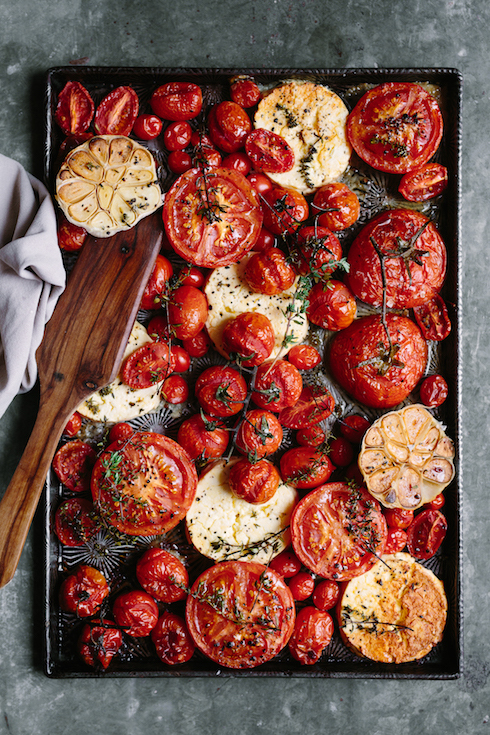 Baked tomatoes with feta, garlic & thyme: add a sheet of foil or non-stick baking paper to the tray, which you can pop in the bin afterwards. No pre-rinsing, no washing up. Roast garlic prawns served with fresh limes. Photography by Tasha Seccombe. 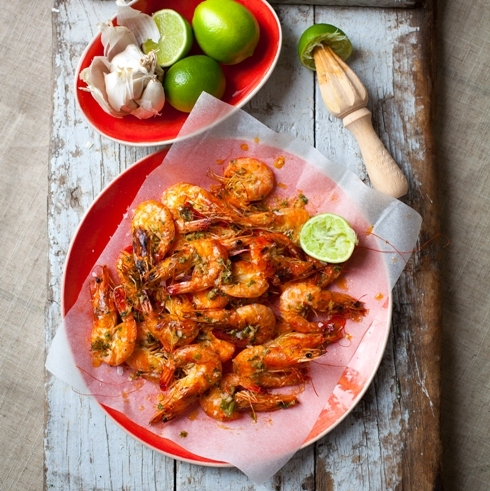 Roasted garlic prawns: another roasted favourite that can be done with a sheet of foil and eaten straight from the pan! 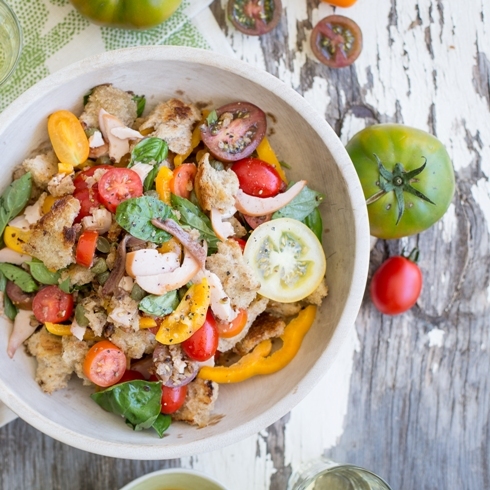 Panzanella: a traditional Tuscan bread salad. Photography by Tasha Seccombe, styling by Nicola Pretorius. Panzanella with smoked chicken: what a delightful, meaty, summer salad with oodles of crunchy croutons – perfect for entertaining a crowd. Make the croutons in the oven on a baking sheet lined with foil and save on washing up! Vietnamese chicken & vegetable spring rolls: although these paper rounds are made of rice, they require no cooking – only one minute of soaking in a little cold water (you can use a wide bowl with 1cm deep water for the whole batch and still reuse the water left for rinsing anything that’s dirty etc.) 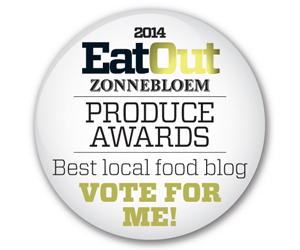 It’s hand food at its best, dipped in a fabulously salty peanut sauce. 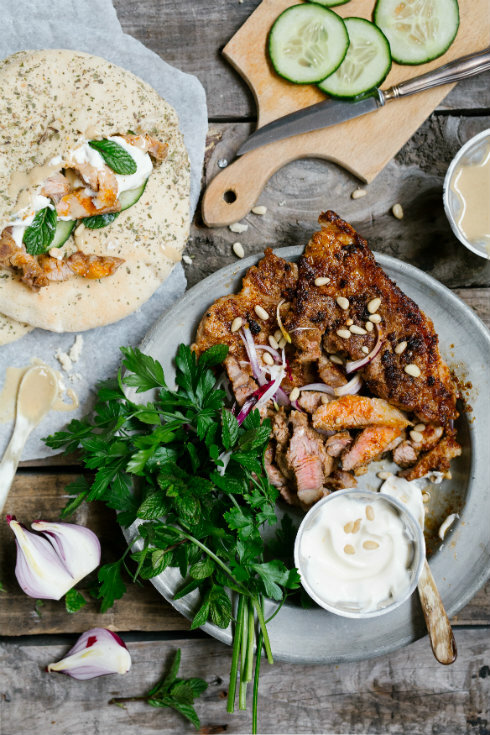 Braaied lamb chops make the ultimate shawarma topping. Photography by Tasha Seccombe. Quick braaied lamb shawarmas: marinate in a plastic bag, braai, assemble on chopping board, eat with hands, wipe with kitchen paper – almost no dirty dishes! Perfect for outdoor entertaining. Scored whole harders, brushed with smoked paprika butter and braaied over hot coals. Photography by Tasha Seccombe. My father is a fisherman. He retired from a corporate job 12 years ago, relocating to Keurboomstrand and fishing as often as he likes. Not only is he a good fisherman, he is a cunning hunter who knows the sea and its currents, the shifting beaches and the favourable winds, the lesser traveled trails and the unforgiving rocky coastal territory. He is a fisherman in heart and soul. When I was young, I went fishing with my father and brothers often. I caught small fish like “strepies”, galjoen and harders. One of my favourite early food memories is of my dad helping me to pan-fry a whole small galjoen at our camping site one December – one that I had caught myself. Bliss. This year, I want to eat more fresh fish. Sustainably caught fish are at the top of my list. Although harders are on SASSI’s orange list because of damaging huge drag nets, smaller batches are being hand-caught by many fishermen and you can buy them fresh from various fish shops and harbours. For this shoot, I had my very first opportunity to scale, gill and gut fresh harders from scratch – quite an adventure. It is not difficult at all, so give it a google and try it yourself! But if you’re not in the mood for a mess, ask your friendly fishmonger to take care of it. 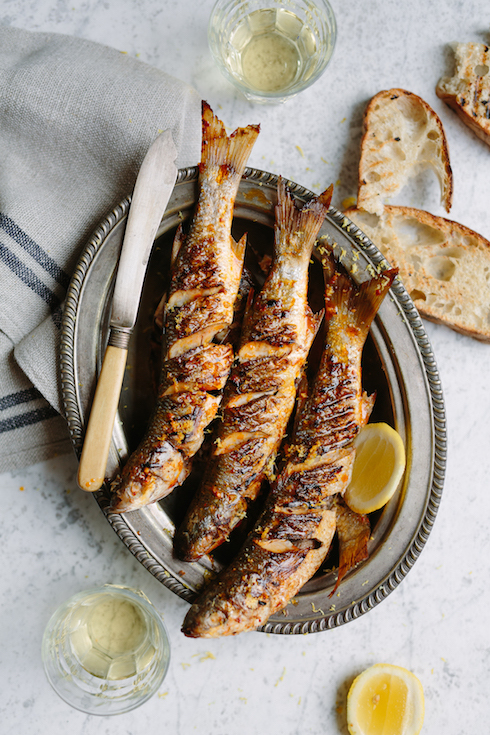 I love the idea of plating whole fish instead of neatly filleted little steaks. 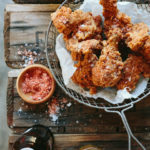 Just score the skins and brush them with a delicious smoked paprika butter. Braai over medium hot coals until done. Serve with fresh bread or boiled potatoes and a fresh green salad. Rinse the harders under running tap water and pat dry. Use a sharp knife to score the skin on the fillet sides. Mix the melted butter, paprika, chilli flakes, garlic and lemon juice. Season generously with salt & pepper. Brush the butter mixture all over the harders, then braai them on a grid over medium-hot coals (turning often) for 8-10 minutes or until just cooked. Baste with the butter often. Don’t overcook. Last week I had the pleasure of making a series of canapés at the launch of Le Creuset‘s new store in Stellenbosch. The first of these canapés were mini “lobster” rolls and they seemed to be a huge hit. 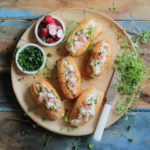 I have to admit, I probably ate about 5 rolls in one sitting after this shoot – they are absolutely delicious with the chunky, sweet, cool prawn mixture and the soft, buttery, warm, toasty rolls that are slightly crunchy on the sides. 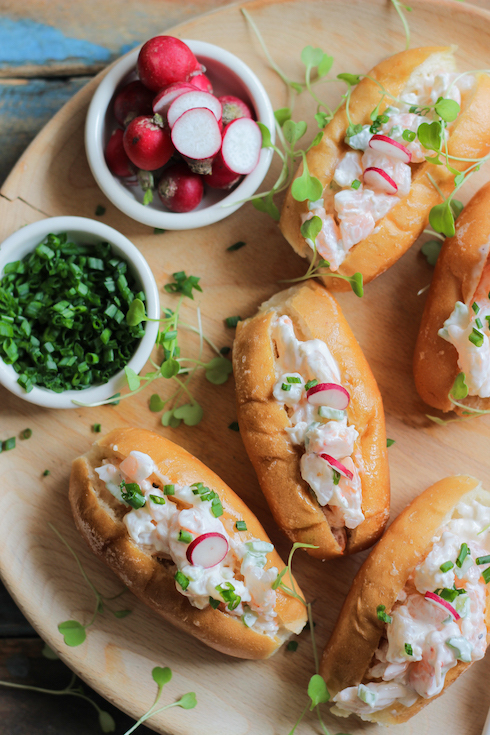 While original lobster rolls are obviously made with real lobster from the New England region in the USA, these little ones were made with prawn tails, lightly blanched to keep their beautifully firm, almost-crunchy texture. Note: West Coast rock lobsters are currently on SASSI’s red list, and so are Mozambican langoustines, so make sure you choose an option that is sustainable and safe to buy. 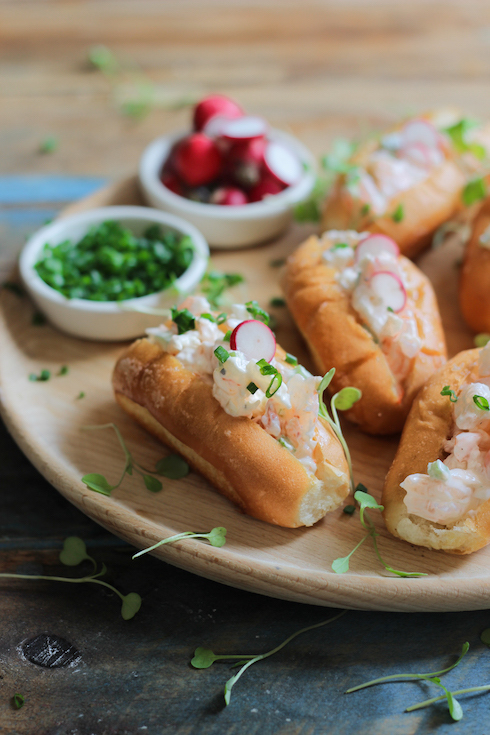 1) A regular soft hotdog roll should be slightly trimmed on the sides, then fried (on the cut sides) over low heat in butter for perfectly golden and crunchy sides (this mimics the classic lobster roll bun). 2) The roll should be cut and filled down the middle (not horizontally). 3) The meat should be cut into bold chunks, not shredded. 4) The filling should be just coated in mayonnaise, not swimming in it. A creamy mayonnaise like Hellmann’s is preferred. 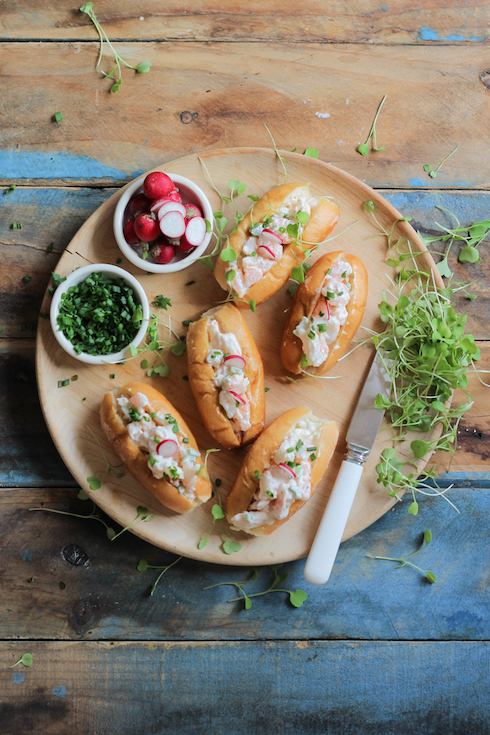 5) Stick with a classic filling mixture: prawn/lobster meat, mayo, touch of lemon juice, chopped celery, chopped chives, touch of salt & pepper. Extras like sriracha sauce or lettuce are prohibited, according to the puritans. I’ve added a few paper thin radish shavings, purely for garnish as I think it picks up the pink in the prawn meat beautifully and it doesn’t affect the flavour of the filling. It’s totally optional. Thaw the prawn meat by running it under cold water to loosen any thicker ice chunks, then leave it to stand at room temperature until ready (about 1-2 hours). Bring a large pot of water (filled with enough water to cover the prawn tails) to the boil, then drop the prawn tails in it and cover with a lid. When it comes to a boil again, cook for approximately 3-5 minutes or until just cooked, then drain immediately. Rinse briefly under cold water to stop it from cooking further, then drain thoroughly and roughly chop into chunks. Place the chopped meat in a large mixing bowl, then add the mayo, lemon juice and season with salt & pepper. Mix well, then taste and adjust seasoning. Cover and refrigerate until ready to use (this can be done a day in advance). To prep the rolls, trim both sides (not ends) of the buns to a flat surface, then cut along the middle (but not right through). Fry the cut sides over low heat in butter until golden, then fill down the middle with the prawn filling. Sprinkle with chopped chives and garnish with a slice of radish. Serve at once. Note: The rolls will feel very soft when they come from the pan – they will crisp up on standing, it only takes about a minute or two. 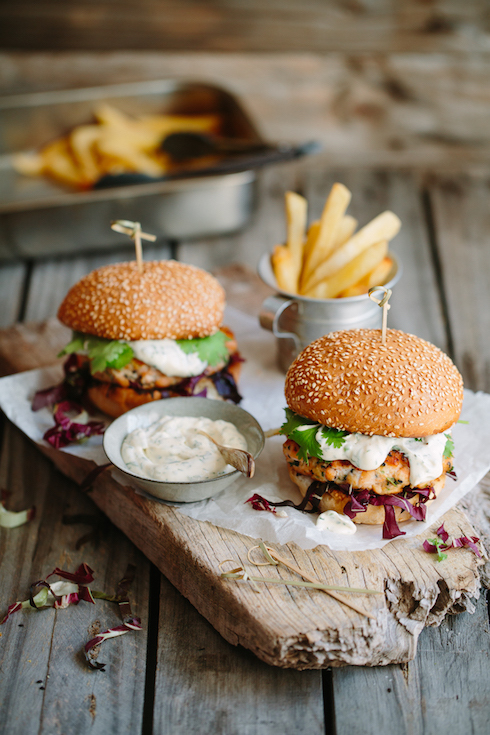 Pan-fried salmon-trout burgers made from fresh, cubed fish fillets, topped with a creamy mayo mix and fresh coriander. Photography by Tasha Seccombe. 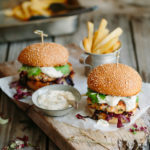 I had the pleasure of developing a burger recipe for the Hellmann’s #rockyourburger campaign last year via The Pretty Blog. 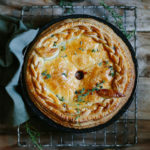 I realized today that I haven’t posted it here, and with such a delicious recipe it simply has to be featured. Seeing that all the classic burgers have been done over again, I decided to give a new twist to a less common yet luxurious favourite: a hand-chopped salmon trout burger made from fresh, raw fish (not cooked, like most other fish patties), pan-fried to pink perfection and served with a sharp and creamy Hellman’s dill mayonnaise. My salmon trout burger is, surprisingly, eggless and contains very little bread crumbs – just enough to get the right texture. For a binding agent, I’ve pulsed a small piece of fresh salmon-trout with some Dijon mustard and mixed it into the fish cubes along with fresh ginger, chopped coriander and grated lemon rind. 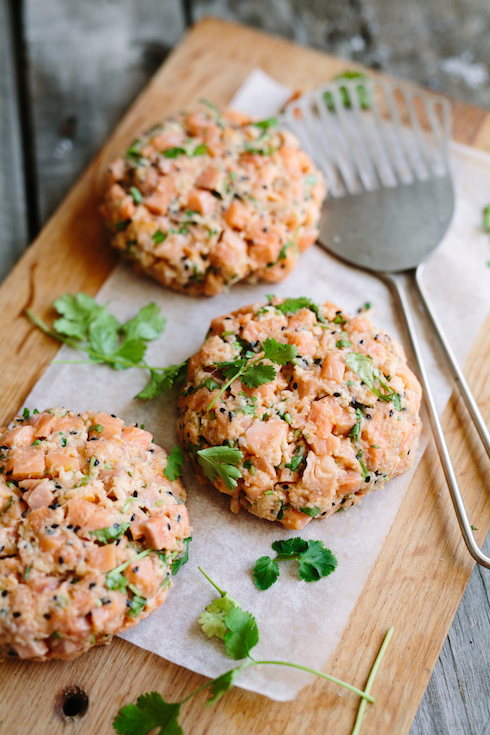 The result is a textural fish patty with phenomenal flavour that holds shape, but also with the added ability to slightly undercook the centre, which is just what you want with beautiful fresh salmon-trout. The dill mayo is perfect with the burger, but also great with some crisp, oven roasted potato chips. Layer your burger with shredded red lettuce and more fresh coriander to taste. 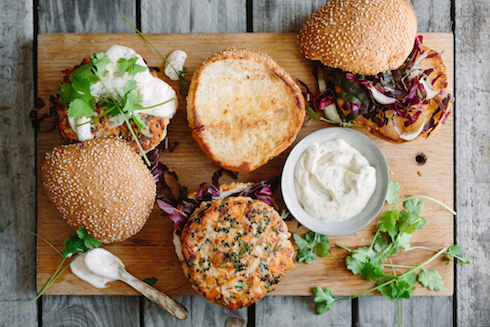 Fish burgers don’t get better than this. Note: Salmon trout is a common term given to describe freshwater or seawater trout that resembles salmon. Trout and salmon are from the same family, and therefor can be easily substituted for one another. 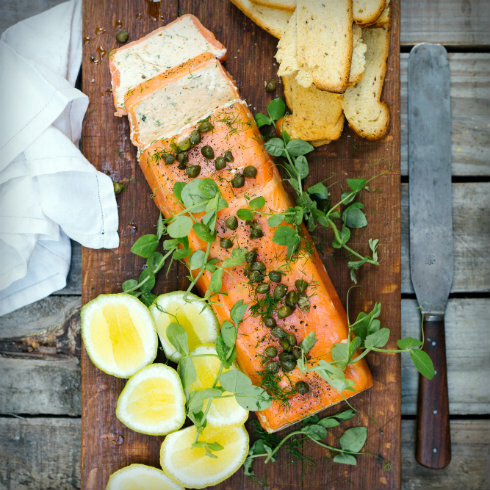 Choose sustainably farmed local rainbow trout for this recipe above imported salmon. Chopped trout, Dijon mustard, black sesame seeds and grated ginger all form part of the burger patties. Photography by Tasha Seccombe. This is what the patties look like before they get fried. Photography by Tasha Seccombe. Place about 1/5 of the fish in a food processor with the mustard and pulse to a smooth pulp. Use a sharp knife, cut the remaining fish into small cubes of maximum 1 x 1cm in size. In a mixing bowl, add the diced fish, fish pulp, ginger, lemon rind, sesame, bread crumbs and coriander with a generous amount of salt & pepper. Mix well (clean hands work well). Divide the patty mixture into four, then shape with your hands into discs. Heat the olive oil in a non-stick pan, then fry the patties on both sides until golden brown on the outside. Do not overcook. Mix all the ingredients together in a small mixing bowl. Place some shredded lettuce on the bottom half of each bun, then top with the patties and a generous dollop of dill mayo. End with more coriander and the top half of the bun. Serve immediately. Assembling the burgers with pan-fried patties, coriander mayo, toasted sesame buns, fresh coriander and shredded red salad leaves. Photography by Tasha Seccombe. 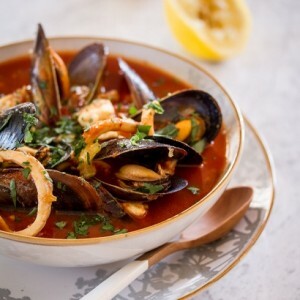 Steamy bowls of bouillabaisse made with black mussels, yellow tail and prawns. Serve with rouille and croutons. 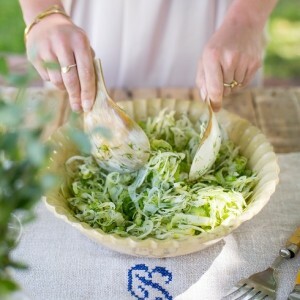 Our friends at Le Creuset South Africa just launched a brand new colour: Ocean. It’s a beautiful graded teal, perfect for flavoursome fish dishes from the deep. 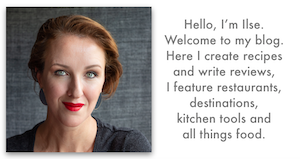 To celebrate this stunning new colour, I’ve collaborated with the team from Le Creuset in creating a new seafood recipe for them (cooking in a 26cm Ocean-coloured casserole) along with a short cooking video. 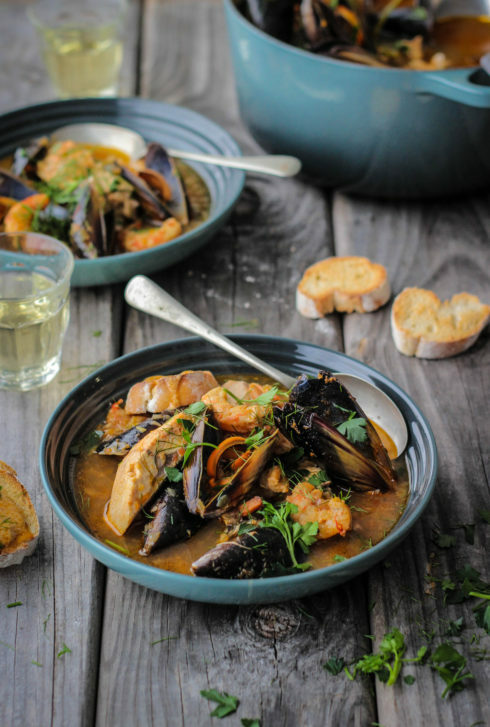 Bouillabaisse certainly is the king of French-style seafood stews, and it was such a pleasure to cook with all the various fresh ingredients in creating this classic, brothy, saffron-induced dish. 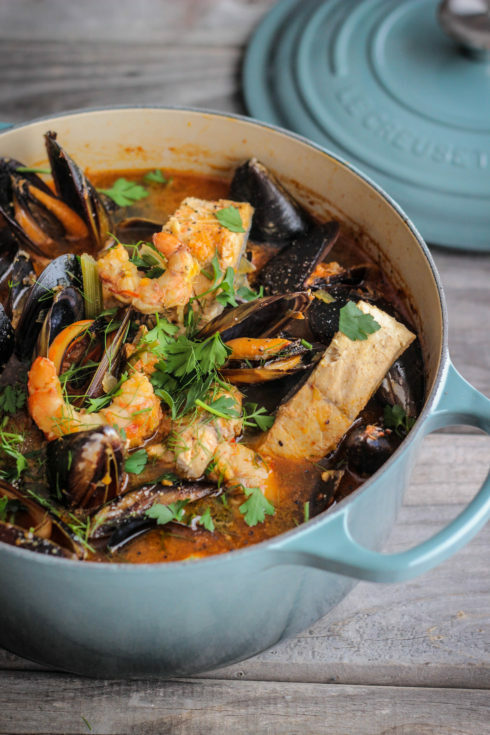 Although bouillabaisse has its roots in humble beginnings as a poor fisherman’s dinner using whatever didn’t sell at the market that day, this French classic takes a little time and effort to prepare: the flavours can only be as good as the love and patience that you put into making a great stock, and your choices of fresh seafood that is cooked to tender perfection. So plan ahead, visit your closest seafood specialist shop, make a proper stock and rouille, and you will be richly rewarded. What an excellent way of entertaining guests at your next dinner party! Shop the Le Creuset Ocean range online. An inviting casserole of bouillabaisse, in Le Creuset’s new colour: Ocean. 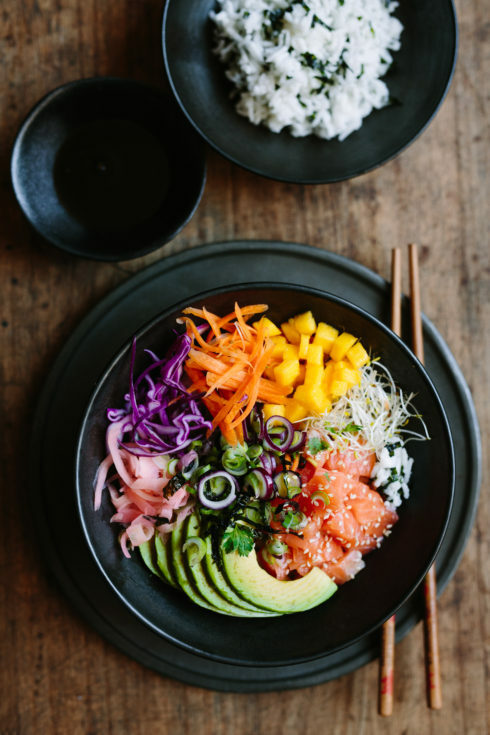 Poke bowls haave been getting a lot of attention in South Africa these days – two years after gaining popularity in the States and elsewhere during 2015. If you have not seen it yet, it’s an age-old traditional Hawaiian seafood dish made up of hot rice (sometimes mixed with sliced seaweed) in a round bowl topped with cubed or sliced raw fish (sometimes marinated), vegetables like avocado or spring onion and a dressing of soy sauce. Poke (pronounced POH-keh) means “cut up” and the end-result is only as good as the freshness and quality of the ingredients. This simple concept wins my vote hands down. You might know that I’m not a salad person, but I absolutely adore the fresh flavours that usually come with Japanese and Vietnamese recipes. 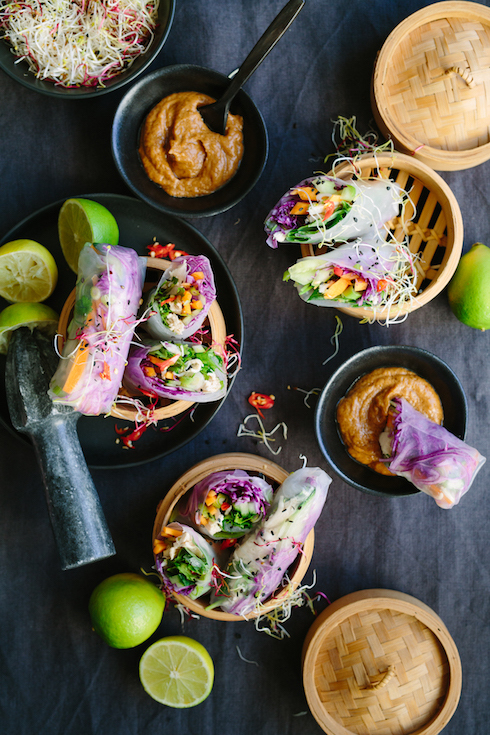 Although this dish is traditionally Hawaiian, the ingredients are astonishingly similar to Japanese sushi and Vietnamese rice paper spring rolls. Popular toppings are tuna, salmon and octopus, but vegetarian options also include tofu and kimchi. New world twists include substitutions like quinoa or freekeh for the base, and tomato, beans, sriracha and mayo on top. This was my first attempt at a poke bowl. I call it “rainbow”, because the colours are just too beautiful: coralicious salmon, pale green avo, pink pickled ginger, purple cabbage, bright orange carrot, green and purple spring onion, grassy green coriander, ivory sprouts and a fabulous tropical summer ingredient: yellow mango. My base is basmati, although sushi rice will work even better. I mixed finely sliced blackish nori sheets and some rice vinegar into my cooked rice for some added zing and lots of umami. This dish is stunning in every sense: visually beautiful, delightfully textural and a taste explosion. 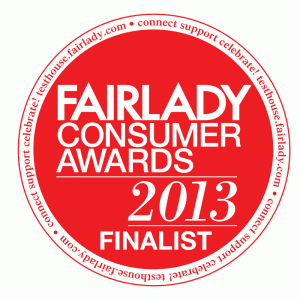 It is a fantastic choice as a pack-in lunch or outdoor picnic. I look forward to exploring many more combinations this year. Cook your rice according to the manufacturer’s ingredients using salted water. When cooked and drained, add the vinegar and sliced nori and stir well. Fill your bowls half-full with the hot rice mixture. Top with salmon, avo, cabbage, carrot, mango, spring onion, sprouts and coriander in neat sections. Sprinkle the salmon with sesame seeds, then add soy sauce to taste. Serve immediately. Spicy black Saldanha Bay mussels with garlic, paprika, and white wine. My friends at Peppadew invited me to participate in a recipe challenge using their brand new #AwesomeAtchar product range. Seeing that this is Heritage Month, it is such a pleasure to explore the possibilities of cooking with this fantastic Indian-inspired ingredient. 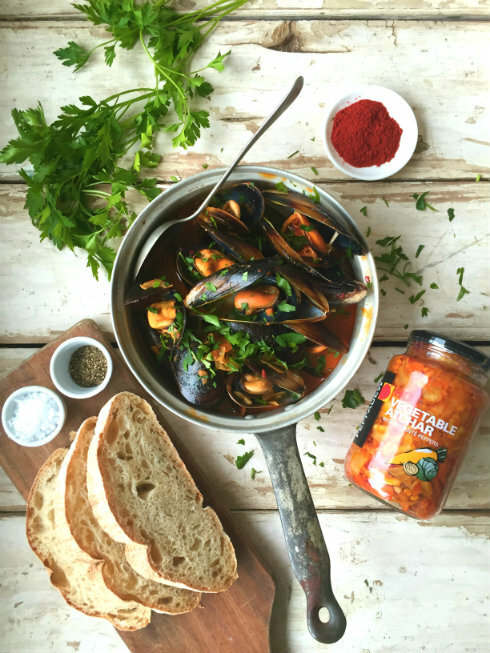 My recipe is a very simple yet mouthwatering starter with big flavour and little effort: spicy Saldanha Bay mussels cooked with Peppadew Hot Vegetable Atchar, garlic, paprika and dry white wine, scattered with your choice of chopped parsley or coriander leaves. The dish can be made from start to finish in 15 minutes. Serve with crusty bread and you have an instant feast! PS: If you don’t like cooking with wine, substitute with a good quality chicken/vegetable stock and a squirt of fresh lemon juice. Heat olive oil in a wide casserole/pot with a lid. Add atchar and garlic and fry over high heat for 2-3 minutes until it starts to brown. Add the paprika and stir for another 30 seconds. Add the white wine and mussels and bring to a boil. Cover with the lid and leave to cook for 5-8 minutes, or until all the mussels have opened. Remove lid, scatter with parsley/coriander and serve at once in bowls with crusty bread. There’s just something about a beautiful terrine that looks like it’s time to celebrate. This festive loaf is lined with smoked trout ribbons and filled with a creamy mixture of flaked cooked trout, fresh cream and lots of herbs. It is not cheap to make, but it will feed a crowd and I promise that they’ll ask you to make it again. I love serving this as an elegant yet laid-back starter with crips melba toasts or crackers and some lemon wedges. 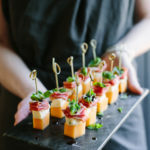 Although this terrine is such a summer stunner, you can make it all year round – all the ingredients should be available in a good supermarket. 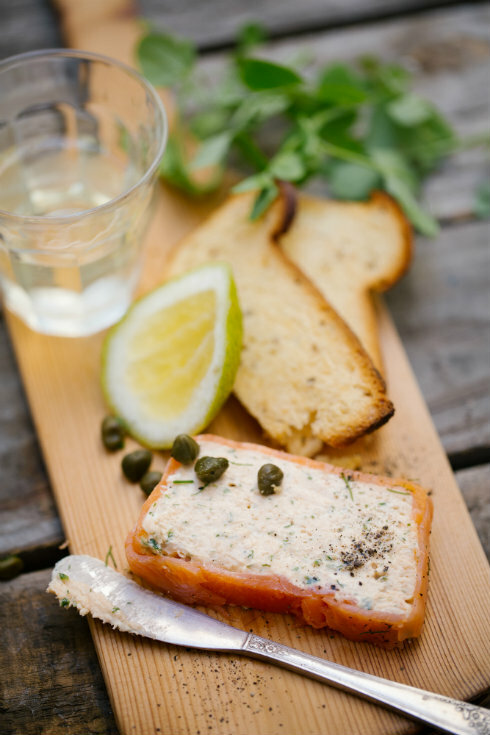 If you prefer a smoky flavour, use hot smoked trout for the filling (if you’re a progressive cook, you might even have the tools to smoke the fish at home! ), but for a milder flavour you can opt for poached/steamed/grilled trout. Use a pastry brush to oil the inside of a classic terrine dish or a 30 x 11 x 7 cm loaf tin. 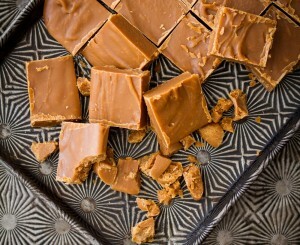 Line the inside of the tin with plastic wrap – leave the excess to hang over the sides for later. Use ribbons of cold smoked trout to carefully line the inside of the tin, slightly overlapping to create a continuous effect (leave 2 or 3 for covering the top at the end). Pour the cold chicken stock in a small sauce pan, then add the gelatine powder and stir to combine. Leave to sponge for 10 minutes, then heat gently on the stove top and stir until the gelatine has dissolved completely – do not boil. Set aside to cool slightly. In a food processor, add the trout flakes, lemon juice, cream cheese and herbs. Now add the still slightly warm gelatine mixture and process to combine. Season generously with salt & pepper, then mix well. Taste and adjust seasoning if necessary. Transfer the mixture to a large mixing bowl, then add the whipped cream and gently fold it in until thoroughly mixed. Pour into the trout-lined tin and use a spatula to smooth the top. Cover the mixture with the remaining trout ribbons, then carefully fold the overhanging plastic wrap over the terrine. Use another sheet of plastic wrap to cover the top of the terrine, then place in the refrigerator to set for at least 4 hours or preferably overnight. To serve, remove the top layer of plastic wrap and fold the sides of the wrap open. Turn out onto a serving board, then carefully remove the tin and rest of the plastic wrap. 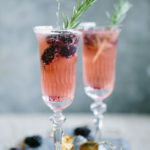 Sprinkle with more chopped herbs or pea shoots and a handful of capers, and serve with a few slices of lemon wedges and your choice of toast or crackers. This whole food revolution (banting diet, paleo, whatever you want to call it) hasn’t exactly caught my attention. Maybe it’s because I’m a sugar loving pastry addict, to be honest. 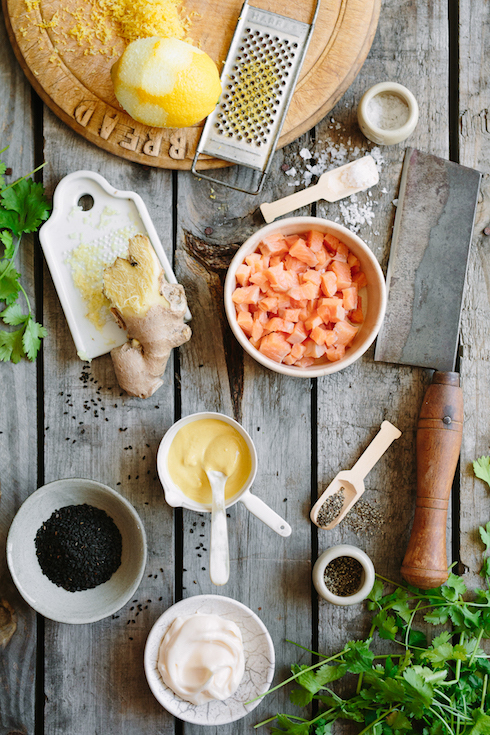 To me, healthy eating involves balance and care when it comes to choosing ingredients. I don’t eat salad all day, but I also don’t cook with over-processed goods. Still, I do admire the fact that butter, cream and bacon fat has become such popular items in househoulds all over the world. Those three have been on my list of favourites for years. I bought Tim Noakes’s book a few months ago, and to my surprise I was delighted by the content. 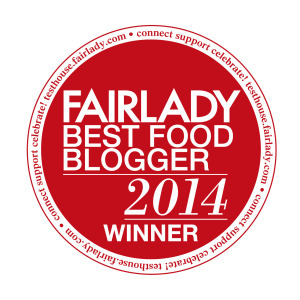 The recipes were simple, full of flavour and very much the stuff that I love to cook at home. 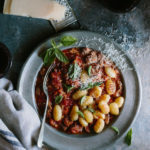 Of course some ingredients were slightly different (like the wheat flour substitutes), but the dishes were beautifully photographed, had great variety and looked delicious. At The Demo Kitchen people often ask me for low-carb menus, so I was forced to start paying attention. 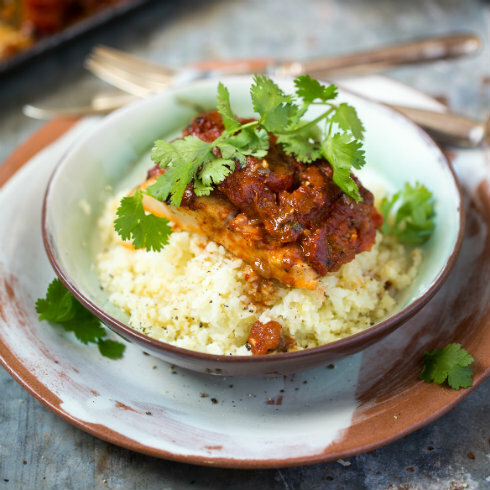 This recipe is inspired by Dr Noaks’s book – fresh hake fillets baked in a spicy tomato sauce that include home-made harissa paste. 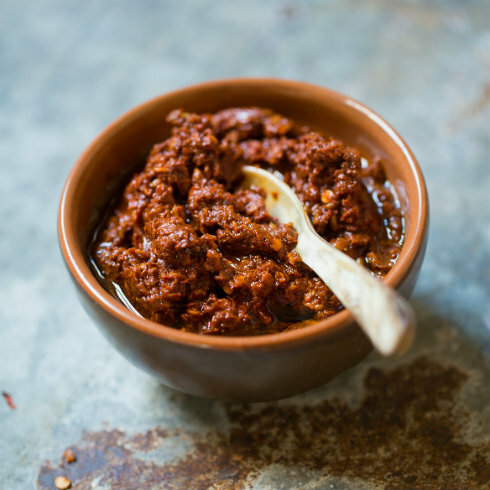 The harissa keeps for weeks in the fridge and is great on almost anything. I especially also tried his cauli-rice, as so many of my friends love eating it. This is a great, flavourful dish for anyone – banter or non-banter. Serve with couscous or rice if you don’t like cauliflower. 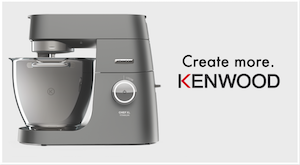 In a small food processor bowl, process all the ingredients together to get a slightly chunky paste. Place in a glass jar, cover with a little extra olive oil, then cover and refrigerate until needed. Will keep for at least 2 weeks in the fridge. 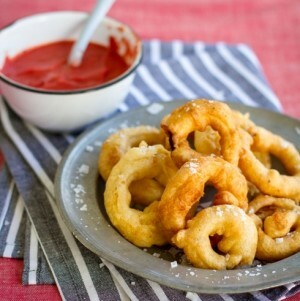 In a medium saucepan, heat olive oil and butter, then fry onions over medium heat until soft. Add garlic and fry for a minute. Now add spices and fry for another minute. Add tomatoes and harissa paste, then bring to a slow simmer and simmer for 15 minutes, stirring often. Add lemon rind and season to taste with salt & pepper. Set aside. Grease or line a large baking tray, then lay the fish portions out without them touching one another. Cover with a generous layer of sauce, then baking at 200 C for 15-20 minutes, depending on the thickness and size of the fish. Do not overbake. Serve hot topped with fresh coriander leaves.